David lives in Reading, Pennsylvania. After graduating from Muhlenberg High School he began work refining steel at Carpenter Steel, a maker of specialty steel and metals, in Reading. He has recently retired after almost 30 years of making his living as a steelworker. He has been drawing since childhood and it has stayed with him into his adulthood. 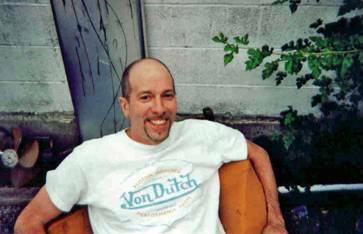 “Dutch” never has a plan or an agenda in creating his works. His subjects are based on what he feels strongly about in life, be it, relationships, life philosophies, or his connection with the world. He not only uses visual imagery in his works, but the written word as well to communicate his ideas and thoughts. His works are more about substance than style and he is always trying to express and discover what makes the human race tick. He also makes constructions and jewelry from found metal objects: a connection to his livelihood. Dutch has been exhibiting his art since the early 1980’s. His work has been shown at several locations throughout the country.